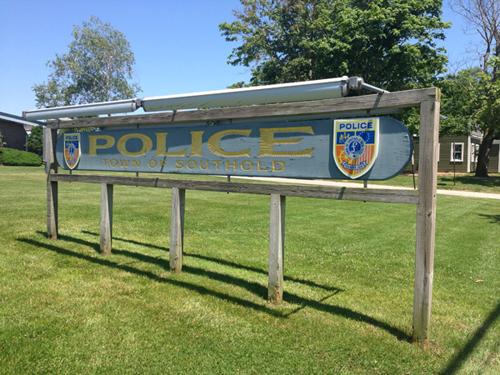 Four people were arrested on driving while intoxicated and drugs charges during an operation by the East End Stop DWI task force in Southold Saturday night, according to a Southold Town police statement. Officers set up sobriety checkpoints and patrolled the North Fork as part of the operation, police said. John Erb, 50 of Levittown was arrested and charged with aggravated DWI. June Kirby, 44, of Hauppauge and Victoria Murray, 29, of Floral Park were both arrested and charged with DWI. Morris Shuman, 70, of Brooklyn was also arrested on the North Fork and charged with DWI and unlawful possession of marijuana, police said. All four drivers were processed and held for arraignment, police said. Five drivers were arrested at DWI checkpoints set up throughout Southold Town by the East End DWI Task Force Saturday night and early Sunday morning, town police said. • Christopher Zukowski, 61, of Southold was charged with driving while intoxicated. • Chelsea Anderson, 20, of East Marion was charged with driving while intoxicated and cited for three traffic violations. • Dillon Cassidy, 26, of Riverhead was charged with driving while intoxicated and cited for three traffic violations. • John Nordin, 50, of Mattituck was charged with driving while intoxicated and unlawful possession of marijuana, and cited for four traffic violations. • Cesar Chavez-Ruiz, 27, of Mattituck was charged with driving while intoxicated and aggravated unlicensed operation of a motor vehicle, and cited for two traffic violations. All of the arrested were held overnight at police headquarters for a Sunday morning arraignment, police said. Police arrested four people for driving while intoxicated Saturday night as part of an East End DWI Task Force operation in Southold Town, according to a police statement. Police said Kevin Manley, 34, of Westbury was arrested and charged with felony DWI and unlawful possession of marijuana, a violation. Riverhead resident Joe Hernandez, 20, was charged with driving while ability impaired by drugs and unlawful possession of marijuana, police said. Two other drivers — James Howard Miller, 61, of Williamsport, Penn. and Rayne Hoeffling, 31 of Greenport — were charged with driving while intoxicated. Southold Town, county parks and state police all assisted in the crackdown, police said. Riverhead Police sent out a warning on Friday that the Suffolk County District Attorney’s “DWI task Force” would be setting up checkpoints in town over the Memorial Day weekend, but seven people were still arrested at those checkpoints Saturday night. Arrested Saturday night at checkpoints in Riverhead Town were the following: Francisco Sabin, 36, of Sound Avenue in Riverhead, for DWI; Pedro Garcia, 30, of Front Street in Greenport, for DWI; Peter Helsinki, 18, of Middle Road in Cutchogue, for driving under the influence of drugs and unlawful possession of marijuana; Matthew Larson, 35, of Town Harbor Lane in Southold, for DWI; Shane Hands, 20, of Hillcrest Drive in Orient, for driving under the influence of drugs and unlawful possession of marijuana; James Hinch, 37, of Sweetbury Hill in Center Moriches, for DWI; and Alisa Raspanjini, 30, of Quaker Hill Path in Huntington, for driving while ability impaired. Police say additional enforcement actions of this type can be expected in the future. The Task Force was established by District Attorney Tom Spota last year and consists of officers from departments in the Riverhead Town, Southold Town, Shelter Island Town, Suffolk County, and New York State police departments. Four men were arrested during an East End DWI Task Force operation in Riverhead Friday night, authorities said. The operation included a checkpoint on East Main Street as well as random patrols in the area conducted by the Riverhead, Suffolk County and Quogue police departments, said Riverhead police Lt. David Lessard. The checkpoint ran from 8 p.m. on Friday night through 4 a.m. Saturday morning and netted four arrests, police said. Rodney Shorter, 36, of Mattituck, was charged with driving while intoxicated and unlawful possession of marijuana, police said. Jose Ortega, 34, of Mattituck and Robert Reddick Jr., 22, of Southampton were arrested and charged with driving while intoxicated, police said. Rodney Trappen, 35, of Aquebogue was also arrested in the police operation and charged with aggravated driving while intoxicated, unlicensed operation of a motor vehicle and unlawful possession of marijuana. Lt. Lessard said the task force, which began this summer and encompasses police departments across the East End, will conduct an additional operation later this year. He advised residents to drive safely during the holidays.